The new Polish Renewable Energy Act (Ustawa o odnawialnych źródłach energii) rewards operators of solar systems with high profitability. 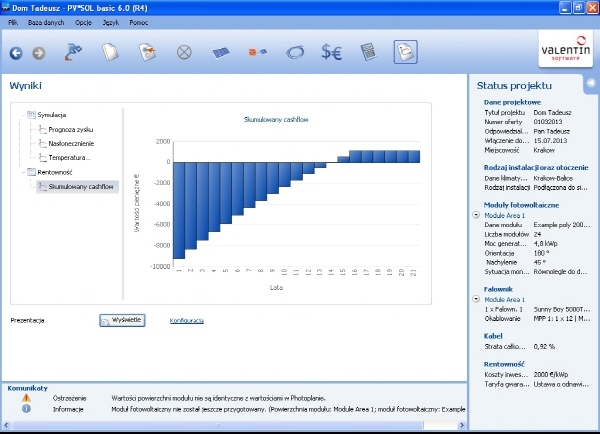 The use of the simulation software PV*SOL basic facilitates accurate and economical design of the system. The cornerstones of the new Ustawa o odnawialnych ?rodłach energii give photovoltaics a key role in increasingly meeting Poland’s energy needs through the use of renewable energy sources. The goals are quite ambitious. The Renewable Energy Act presented by the Polish Ministry of Economy stipulates that by 2020 15.5 percent of the electricity demand in Poland should be covered by renewable energy sources, i.e. electricity from solar, wind, hydro and biomass. And it is photovoltaics which has been assigned a key role. This is reflected in the particularly attractive financial compensation for solar power. For systems up to 100 kW, this is 1.10 PLN (0.27 euro cents) per kilowatt hour fed into the electricity grid. This compensation is paid from the commissioning of the solar system for a period of 15 years. For larger plants from 100 kW power, there is no fixed feed-in rate. This is calculated based on the market price of electricity, the amount of energy produced from renewable energy and a technology-dependent correction factor. But also here the promotion of solar energy is in the end at the forefront, since the correction factor of x 2.85, which is applied for photovoltaic systems over 100 kW, is in turn the highest of all renewable energy sources. As the funding for the program is limited and will be reviewed every three years, it’s worth signing up now, at the beginning of the funding program, in order to benefit from the highest return for the full 15 years. In the planning of solar systems, installers and engineers increasingly seek the support of professional software, as there are so many factors to be considered when designing a system. The latest program version PV*SOL basic 6.0 from Valentin Software in Berlin has just been released with Polish as an additional language. The dynamic simulation program for the design and planning of grid connected PV systems is aimed at the specialist firm designing roof systems with up to 1,000 modules. The program allows the design to be undertaken photorealistically, with a digital photograph of the house, graphically, using freely-configurable roof forms and mounted systems with any orientation, as well as numerically, with the direct input of the site parameters and system components. As with all PV*SOL versions, PV*SOL basic 6.0 has an extensive module and inverter database with over 11,500 modules and around 2,500 inverters, which are always kept up to date by an automatic update function. System designers therefore have full access to the components available on the market. With PV*SOL basic 6.0 inverters with variable connection options for the input (due to a second MPP tracker) can also be easily designed and simulated. New in version 6.0 is the possibility of entering the cable lengths and cable cross-sections for the string, DC and AC cables. • Presentation of all simulation results in a detailed project report as a compelling basis for decision making for designers, building owners/developers and financers. PV*SOL basic 6.0 is an easy tool for the design and simulation of grid connected photovoltaic systems. The program guides you step by step through the complete design of a solar system. After entering the basic project data, the climate record for the proposed location is selected. The selection is made either via an interactive map, or via a list view. The integrated climate data tool MeteoSyn has climate records from 8,000 weather stations around the world ready for selection. Figure 1: The integrated climate data tool MeteoSyn has climate records from 8,000 weather stations around the world ready for selection. With PV*SOL you can design both grid-connected photovoltaic systems with full feed-in and also net-metering systems, if electrical appliances are to be supplied on site directly with the self-generated solar power. The program then provides editable load profiles for electrical appliances. In selecting the components from the database you will be supported with a comfortable search and filter function and also a favorites list. Figure 2: In the extensive module and inverter databases there are currently around 11,500 module and 2,500 inverter records, which are constantly updated by an automatic update feature. The module area can be defined either direct via data entry, i.e. by entering the installation, inclination, orientation and number of modules, or by using a graphical layout. Alternatively, you can also determine the number of photovoltaic modules and the roof pitch based on a digital photo. The integrated photo-dimensioning program Photo Plan serves as a visualization tool for quick and easy system design on the customer’s roof. From a photo and the dimensions, the respective roof can be represented photorealistically with the photovoltaic system. 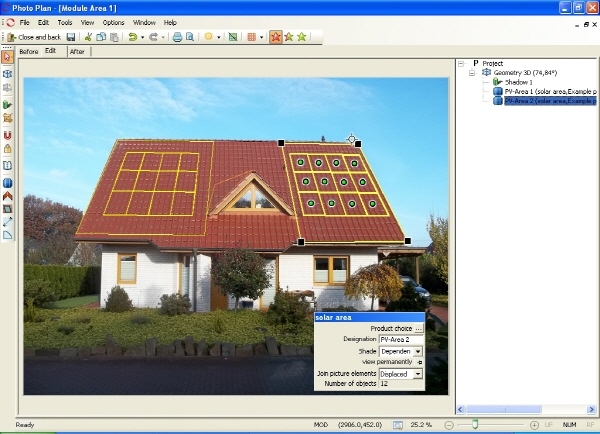 The graphical determination of the number of modules on the roof is considered using freely-configurable roof forms with any number of coordinates, the division of the roof into several PV areas and the visualization of flat roof systems with module orientations that are not parallel to the roof edges. Figure 3: The integrated photodimensioning program Photo Plan serves as a visualization tool for quick and easy system design on the customer’s roof. After adding the modules, a number of steps follow: inverter selection, configuration and entry of the cable lengths and cross-sections. In addition to manual inverter selection, the program also offers automatic inverter configuration with results sorted by priority and the individual adjustment of the sizing factor. Even inverters with special variable connection options for the B-input (2nd MPP tracker) can be designed and simulated with PV*SOL basic 6.0. A new feature is the possibility of entering the cable lengths and cross-sections for the string, DC and AC cables. Alternatively, you can enter the total cable losses directly. When all the systems parameters have been defined, PV*SOL simulates the solar yield and calculates the return on investment and the system payback. The yield of the photovoltaic system is calculated based on a minute-step simulation with the empirical climate and insolation data and the properties of the selected system components. The yield and financial forecasts take into consideration the current compensation and consumption regulations. This means that not only the tariffs for the user’s own country are available, but also those of other countries. This is particularly interesting for planners who are active as plant engineers internationally. All regional settings and tariff models can be customized and extended. Figure 4: The yield and financial forecasts take into consideration the current compensation regulations. The presentation of the system design and the results of the financial analysis and yield calculation are shown in the detailed project report. 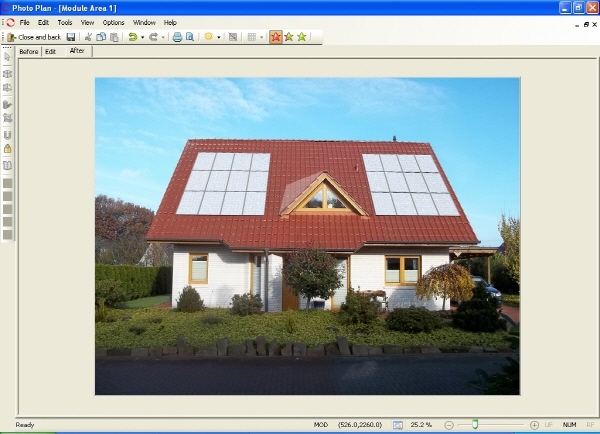 The simulation and design program PV*SOL from Valentin Software enables the planning of photovoltaic systems for very different system types - from a rooftop installation on a small family home to a large PV plant with up to 1,000 modules. System designers are supported by clear step-by-step user guidance, constantly updated databases of climate and insolation data, as well as the data available on the market for modules and inverters. The program gives system designers concrete configuration recommendations, but always allows the free configuration of the components. The detailed project report presents the results clearly and thus provides useful support in reaching convincing decisions for all those involved in the construction of the solar system. In this way solar energy can become a model for success. Engineer Matthias Brake works as an architect and energy consultant in Berlin and writes about the latest developments in the use of renewable energy and efficient building technology. Looking back on 20 years of successful corporate history, Valentin Software has since become the world market leader in planning software for sustainable energy supply with the brands PV*SOL®, T*SOL® and GeoT*SOL® for the dynamic simulation, design, yield and financial analysis of photovoltaic, solar thermal and heat pump systems.